Frankly, I cannot see how anyone with a vote in the USCF could vote against you. Somehow, I have been reading your material in full. Never before have I seen such extensive research presented on the state of the USCF. The delegates should show their gratitude and put you to work for them and for chess. I do not see how drug testing has anything to do with competitive chess at this juncture. The only result of such testing can be an ugly invasion of privacy. A person on drugs -including alcohol- is highly unlikely to be successful in the arena of our sport. There is but one item with which I strongly disagree. 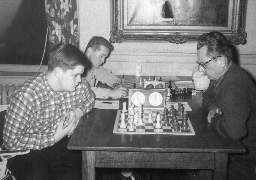 Grandmasters are the preeminent chess teachers. USCF should use that resource and pay well for their writings. I find that when I teach various persons, these persons have to unlearn what they have learned -and this more often than not. If School Mates is filled with high quality instructive material, the magazine will become very popular, even internationally. Instead of the past practice of spending good money after bad, by creating a fine School Mates magazine the USCF will make money. In other words, USCF will not have to feel guilty of properly raising scholastic dues. It also seems to me that many of the contracts entered upon by USCF were illegal in essence. For one thing, there was too much of "one hand washing the other" for those contracts to be taken seriously. Also from what I read from your papers, the service to the USCF received from the recipients of gross financial gain did not come to provide the services nearly enough to warrant the payments made or to be made. Thank you for your service to chess, particularly as this was always at your own expense. Please stay away from "odds chess", as this will seriously detract from the time you might give to serving a good cause. Based on the work I see you are always doing, I am sure you have little time for your own personal life. So don't forget to balance!